Peak Hill Aboriginal Medical Service started collecting research information for the Talking About the Smokes project back in September 2013 under the guidance of CEO Chris Peckham. Chris recruited Bernadette ‘Bernie’ Hazel to speak with the mob from Peak Hill about their smoking stories. Bernie is an Inigui woman from Central West Queensland called Barcaldine, her father a Wakka Wakka man from Gayndah in Queensland; but Bernie has called Peak Hill home since 1989 and has six children who were born on Wiradjuri country. 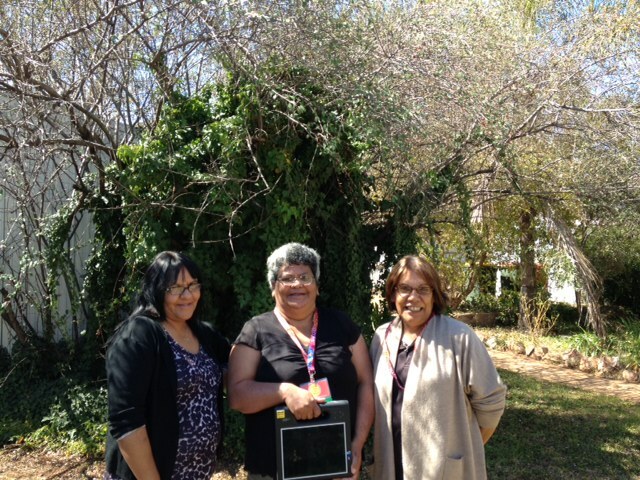 “My experience in working in the Peak Hill Aboriginal community was very rewarding, as we all had a good yarn about the smokes and how it has an impact on our family and children. Most of the participants, who smoked, struggled with giving up and would like to overcome it for a better healthy lifestyle. The first step was admitting they had a problem and the awareness of the help they can get from our services and Doctors at the Peak Hill AMS,” Bernie told Tav Fox (Project Coordinator for Talking About the Smokes) during their de-brief at the end of Wave 1. Bernie’s dedication and commitment during the first Wave of the TATS project in her community saw the project finish a week early! Bernie had reached the targets within 5 weeks, showing her great research and communication skills, and her strong connection to her community. She has now continued to support her local community by being employed at the Peak Hill AMS as an Aboriginal health worker and is continuing her study in Aboriginal primary health. Wave 2 of the TATS project will return to Peak Hill AMS in September, Bernie hopes that this time she will be a mentor for a younger community member to collect the data and give valuable experience to a future up and coming Aboriginal health worker in Peak Hill. If you’d like to find out more information about the Talking About the Smokes project, please contact Josie May at Josie@naccho.org.au or by calling (02) 6246 9300. Welcome to the Chrissy edition of the Talking About the Smokes newsletter. A lot has happened since our last newsletter. We have almost finished our Wave 1 work at nearly 21 health services thanks to all the great local Research Assistants in those sites. We are also over half way to our goal of involving 40 Aboriginal Community Controlled Health services from around the country. We have representation from all the states and territories. It is very exciting to hear about the participants and the work that many people are doing to achieve such great results. Thank you all for your commitment to this important work. David , Darren, Anna, Helen, Josie, Arika and Tav.